Last year Craig and I set out to make canned good as Christmas presents. 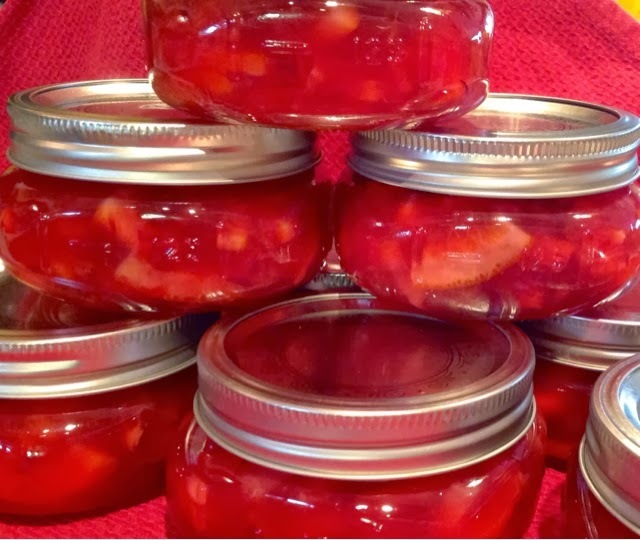 Well, we achieved our goal by making Bread and Butter Pickles, Honeycrisp Apple Jelly and Butter, Pineapple Chutney, Blueberry Lime Jam, Boysenberry Jam and Marionberry Jam, not to mention some Fig Spread from donated figs from a good friend. So this year, I thought let's do this again, with a few different canned goods. Today marks the first of many canning projects this year. 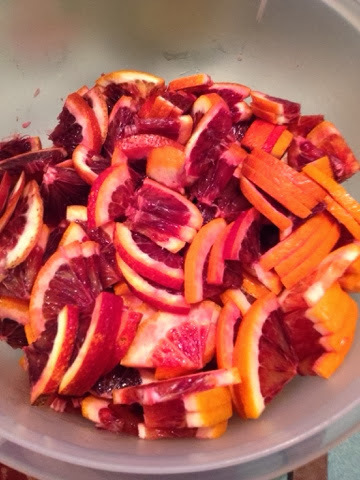 With a great sale and a limited season, I jumped on a few pounds of Blood Oranges, also known as Tarocco, native to Italy, Sanguinello, native to Spain, and the Moro, which is the newest variety of the three, and the most common in the area we live. 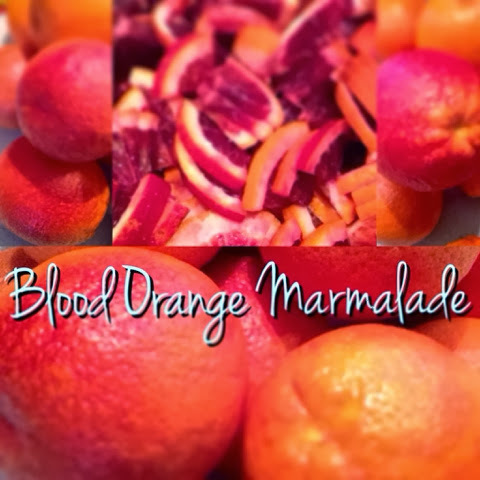 Blood Oranges are a variety of orange with crimson, almost-blood-colored flesh. The fruit is smaller than an typical orange its skin is usually more pitted, but can also be smooth. The distinctive dark flesh color is due to the presence of antioxidant pigments common to many flowers and fruit, but uncommon in citrus fruits. The flesh develops its characteristic maroon color when the fruit develops with low temperatures during the night. Sometimes there is dark coloring on the exterior of the rind as well, depending on the variety of blood orange. The skin can be tougher and harder to peel than that of other oranges. 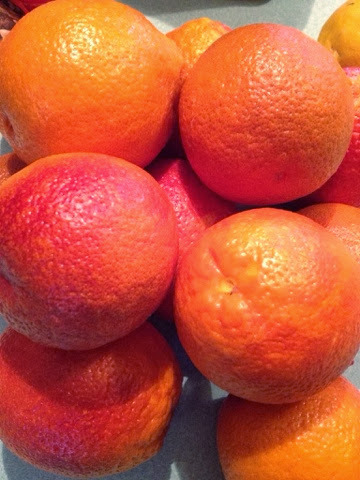 While all oranges are likely of hybrid origin between the pomelo and the tangerine, blood oranges originated as a mutation of the sweet orange. In Europe, the Arancia Rossa di Sicilia (Red Orange of Sicily) has Protected Geographical Status. Sterilize your jars in your preferred manner. Put fruit, sugar, liquid and lemon juice in a 4-quart, non-reactive pot and bring to a boil. Reduce temperature and cook at a simmer for 10-15 minutes (you want it to look syrup-y and shiny). Bring back to a boil and add pectin. Stir to combine and let bubble for 2-3 minutes. 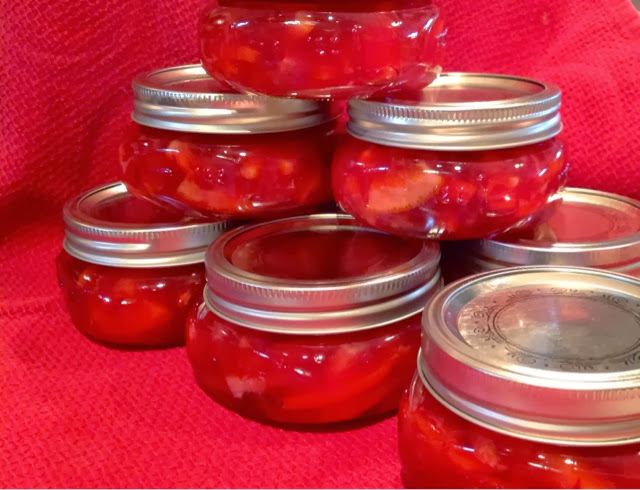 Remove marmalade from head and ladle into jars. Wipe the rims and threads of the jars with a cloth dipped into your sterilization water and apply lids and bands. Put into water bath and process for ten minutes.